Warning: this post could make you wish that you worked somewhere else. I'll begin by stating that my job comes complete with all of the ups and downs that any office workplace does - including internal meetings that drag on, umpteen spreadsheets to study, crazy deadlines, and the like.... What makes the difference, is that the people I work with are often exceedingly kind to me. This past month in particular, I've had a couple of "gluten free gift" moments. By this I mean situations where someone has been particularly thoughtful and shown me kindness through food. First, there was the dreaded fundraiser bake sale at the office. Lori showed up with a batch of gluten free brownies for me and a fellow gluten-intolerant colleague to share. She even brought in the bag from the mix she used to calm any anxiety we might have about ingredients. Lori's husband is a 'lifer' celiac like me (diagnosed as a child)... she gets it. Second, the dreaded lunch n' learn training session... with, you guessed it - take out pizza. I couldn't wait! Why? Because Denise had heard that Pizza Nova delivered gluten free and opted to choose this chain for our order so that I could partake. She even sent me a link to the site to validate that I was comfortable with this choice. It brought tears to my eyes. You should have seen my face when I lifted the lid of this box... pizza with my peers. A very rare occasion indeed. Hey, I don't live in a dream world. I have bad days... and sometimes I still sulk a little and feel left out. I'm one of many here, and I certainly can't expect to be considered every time there is food. We're human. We're busy. But man... when someone goes out of their way to consider my gluten free needs... I can hear violins. Thank you to my team mates. I believe that the onus is on me to return the favour for others. Would be great to hear your "gluten free gift" stories and ideas on how we might "be the change" and spread the reciprocal love. This doesn't happen to me, instead I'm the one who organises the food, birthday cakes etc. I just make sure that they're suitable for my InTolerance issues and when the compliments come rolling in, I tell them that the food was gluten and lactose free. This way I'm safe and my workmates have their eyes opened to the yummy choices that are available. This is great to know that Pizza Nova will deliver a GF "pie." There are other companies out there that do Gluten free pizza but it's store pick up only. So when my family orders in their yummy Friday night pizza I'm stuck with the mini frozen discs I have in my freezer and craft my own pie. "Hey kids, this Friday order from Pizza Nova and I'll have some too!" Thanks Claudine. Keep all the great info coming. gluten-free gift offers inspiration and advice for regular people on an irregular diet, as seen through the eyes of a gal who has been “living it” since 1971. 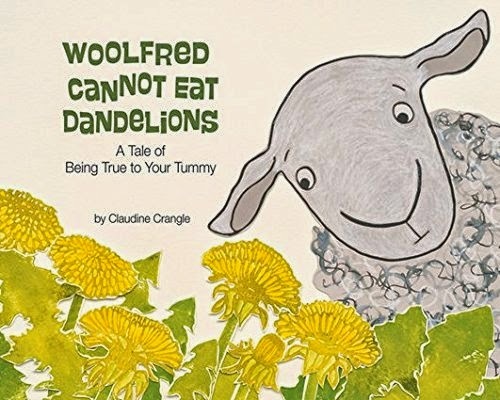 Claudine Crangle is the author of Woolfred Cannot Eat Dandelions (American Psychological Association 2014) and Living Well with Celiac Disease: Abundance Beyond Wheat & Gluten (Your Health Press 2006). gluten free for 47 years!!! Gluten Free Rome - Roma Senza Glutine! Woolfred wins a GOLD Moonbeam Children's Book Award!! click to download print and share! copyright claudine crangle 2011-2014. Powered by Blogger.